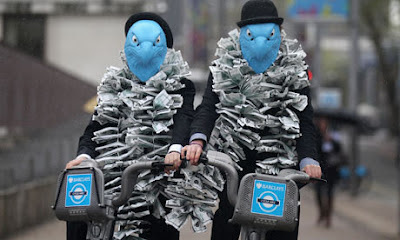 “Have they lost their minds?” one local resident asked me on hearing that Hammersmith and Fulham Conservatives have agreed to hand over a staggering £2 million of council funds for the Barclay’s Bank/Boris Bike Scheme. Why they are giving away any public money to anything to do with the recently discredited Barclays Bank is hard to fathom. But this looks like a grubby favour done to help their close friend Boris Johnson - the Mayor of London. You also have to ask yourself what type of incompetent, spendthrift, public-money-squandering bozo negotiated such a deal that it can only go ahead if a small Borough like Hammersmith and Fulham hands over £2m of extremely scarce resources? Hammersmith and Fulham’s Conservative Administration says that the residents shouldn’t be too bothered because the council received this £2m as statutory planning gain from a property developer. But, that conveniently ignores all the lost opportunities of other important things this money could have been used for such as improving local infrastructure, investing in critical services or sorting out the Borough’s finances. This deal stinks. It appears to be done for no other reason then to help out a political mate. Why weren’t Barclays Bank asked to pay? As much as I think it would be good to have a scheme such as this in our Borough, I do not think it is worth £2 million and neither do any of the residents who have contacted me about this. This council has a habit of lying to the public over and over again. Even in this week's H&F paper, they have mentioned that both the developer and the council are in negotiation with the Goldhawk Traders. The truth is, till today, there has NEVER been any negotiations. WebsterDixon solicitors even wrote to them.....did they ever get back? NO! so H&F, speak the truth and see you in court again!